The mud and the rein - Kris Spin, ridden by Richard Patrick, won the �40,000 Edinburgh Gin Handicap Hurdle Race at Kelso last weekend (picture by Alan Raeburn). There’ll be a quick turnaround at Kelso Racecourse, following Saturday’s high-profile fixture, as the Borders track hosts Buccleuch Cup Day this coming Monday, April 16. The first race, The Duncan and Margaret Sinclair Memorial Novices’ Hurdle Race, is off at 2.10pm. Lucinda Russell holds a strong hand with three entries, including Chasseur do Tete, Le Frank and Prince Dundee. Next on the card is The Tarrag Naegel Ltd Handicap Hurdle Race, in which Russell’s Hail Us In could make a quick reappearance, having won at Kelso on Saturday. She also trains Jump For Dough, who runs in the colours of the Low Flyers Syndicate, a group of annual members at the racecourse. 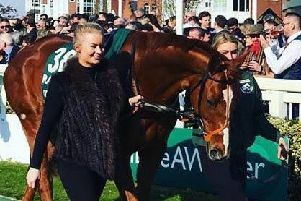 Sandy Thomson, whose stable star Seeyouatmidnight runs in the Grand National on Saturday, intends to pencil in John Williams in the fifth race of the day. The Greenlaw-trained gelding was a close runner-up on the corresponding card last year. The Brewin Dolphin Buccleuch Cup is always well supported by the Borders Point-to-Point community and Diamond Brig, Chanceiton and Whisperdale are possible entries for well-known connections. Diamond Brig, home-bred and trained by Wendy Hamilton, and has two wins between the flags to his name this year. Chanceiton, trained by Lucinda Russell and owned by her father Peter, has point to point wins at Alnwick and Corbridge to his name this term. Whisperdale is trained by Stuart Coltherd’s wife, Lesley, and made all to score at Alnwick on Easter Monday. Gates open at 12.10pm and tickets will be available at the entrance on the day.